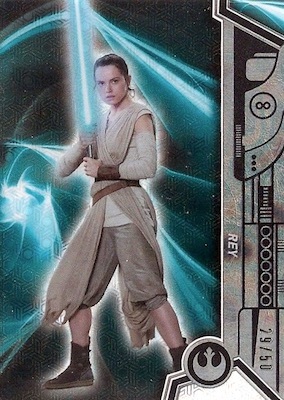 Now a familiar sight for many Star Wars card collectors, 2017 Topps Star Wars High Tek echoes the belief that there is no point in fixing something that is not broken. That's not to say there aren't updates and new options to chase in comparison to the 2016 product. Nevertheless, the set once again relies on acetate stock with one signed card in every box. 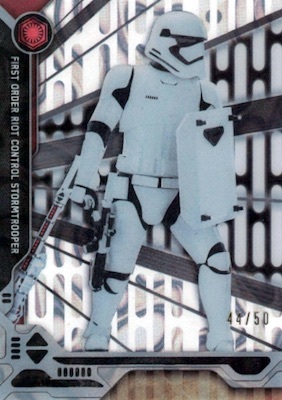 As most collectors are aware, High Tek is known for a variety of designs, patterns and rarity. The 2017 Topps Star Wars High Tek checklist maintains that formula with 112 base cards split evenly. 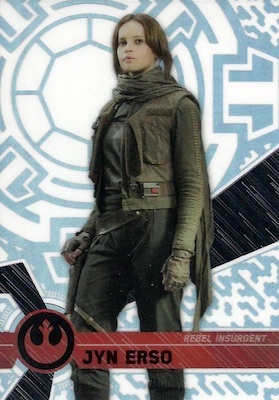 In this case, there are 56 cards that feature Rogue One subjects and the remaining 56 cards offer other Star Wars characters. Beyond the various patterns, low-numbered parallels include new Tidal Diffractor (#/99), as well as Gold Rainbow Foil (#/50), Orange Magma Diffractor (#/25), Green Cube Diffractor (#/10), Red Orbit Diffractor (#/5), and one-of-one Black Galactic Diffractor editions. Printing Proof cards are another one-of-one option. 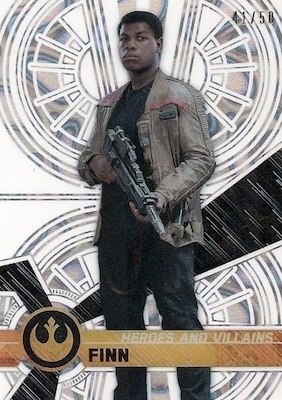 Providing four sets and a total of 56 additional cards, the 2017 Topps Star Wars High Tek insert lineup works with several themes. 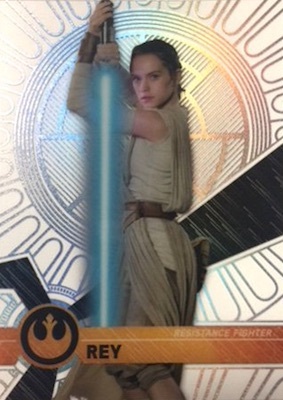 A More Elegant Weapon naturally highlights subjects who favor the lightsaber, while Heroes and Villains TFA focuses on the good and the bad characters from The Force Awakens. 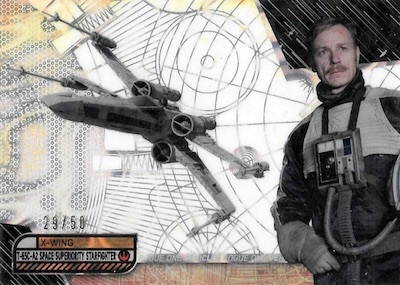 You can also find Rogue One Vehicles, and Troopers, which documents the various forms these soldiers take across the franchise. 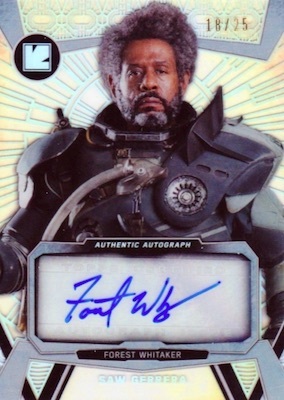 Boasting over 40 signers, some of which are available for the first time, the 2017 Topps Star Wars High Tek autograph lineup makes good use of the base design. Parallels are also similar, with Tidal Diffractor (#/75), Gold Rainbow Foil (#/50), Orange Magma Diffractor (#/25), Green Cube Diffractor (#/10), Red Orbit Diffractor (#/5), Black Galactic Diffractor (1/1) and Printing Proof (1/1) versions. Another new element is found in the Dual Autograph set. Limited parallels for these include Orange Magma Diffractor (#/25), Green Cube Diffractor (#/10), Red Orbit Diffractor (#/5) and Black Galactic Diffractor (1/1). See the full pattern guide and gallery. PARALLEL CARDS: Tidal Diffractor #/99, Gold Rainbow Foil #/50, Orange Magma Diffractor #/25, Green Cube Diffractor #/10, Red Orbit Diffractor #/5, Black Galactic Diffractor 1/1, Printing Proofs 1/1. 56 cards. Shop on eBay. PARALLEL CARDS: Tidal Diffractor #/75, Gold Rainbow Foil #/50, Orange Magma Diffractor #/25, Green Cube Diffractor #/10, Red Orbit Diffractor #/5, Black Galactic Diffractor 1/1, Printing Proofs 1/1. PARALLEL CARDS: Orange Magma Diffractor #/25, Green Cube Diffractor #/10, Red Orbit Diffractor #/5, Black Galactic Diffractor 1/1. If you want a bunch of low end autos, this product is for you. Not worth the price you pay for a box. 2017 TOPPS STAR WARS HIGH TEK HOBBY SEALED BOX - IN STOCK!